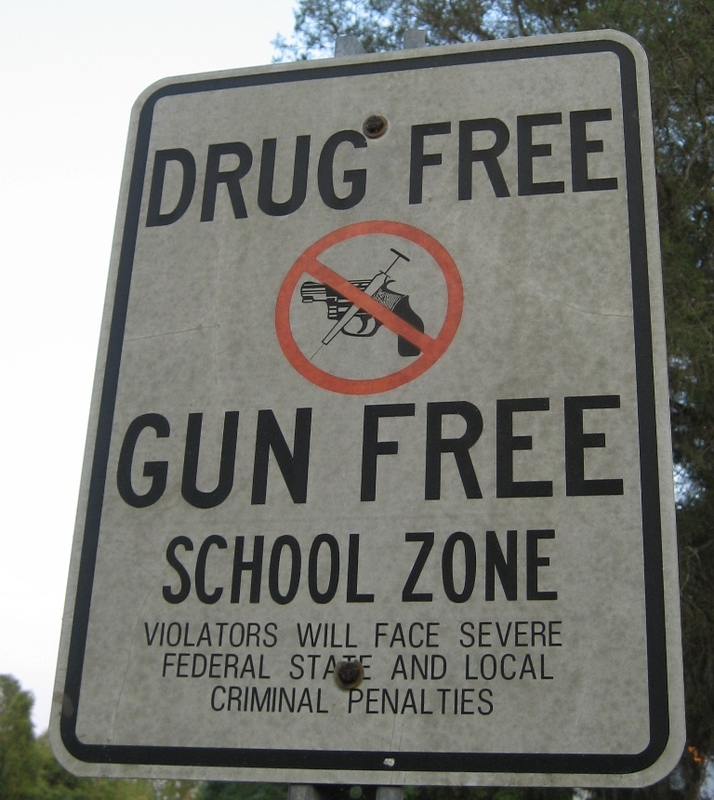 A sign prohibiting drugs and guns stands outside of a school. If teachers were to be armed, schools shootings may be a thing of the past. In the wake of the Parkland, Fla., mass shooting, Florida House legislators approved a $67 million program which would provide teachers with the proper training to carry a handgun. The goal of this program is to have ten teachers trained to carry in each school, which would equal 37,000 statewide. Florida would cover the costs of background checks, drug testing, psychological exams, and 132 hours of training. The decision for teachers to carry would be their own, and a $500 dollar stipend would be given to those who do. However, if a teacher does decide to carry, it would mean the school would be better secured. A school district in Arkansas had already shown that giving teachers the option to arm themselves can work. For almost five years, Clarksville School District has had 20 teachers, janitors, and other staff members ready to respond in the case of a shooting. The teachers also receive yearly training. “Every second that ticks by is a possibility of a life lost. What we’ve gathered from this is that it can be done, it can be done right,” Clarksville Schools Superintendent David Hopkins said. All sites of school shootings have been designated “gun free zones.” In fact, over 98% of mass shootings have been in “gun free zones.” Making a school a “gun free zone” has absolutely no effect. In fact, shootings have even been stopped due to good people with guns. In Sutherland Springs, Texas, Devin Patrick Kelly, the man responsible for the church shooting that claimed the lives of 16 people, was stopped by an armed citizen, who was an NRA member. In 1996, Luke Woodham entered Pearl High School, and murdered two students, but was then stopped by Assistant Principal Joel Myrick and his Colt. 45 that he kept in his car. When individuals choose to commit mass shootings, they target gun free zones. Why? Because they know there will not be any resistance. For example, the Sandy Hook shooting. When Adam Lanza went to Sandy Hook Elementary School and murdered 26 innocent people, the only form of defense to stop him was a “Gun-Free Zone” sign. Imagine how different the events at Sandy Hook would have occurred had teachers and staff been armed and ready to protect students. Students in America should not have to live with the fear of dying at school. However, in today’s world, school shootings are something that people need to be prepared for. In America, banks are protected with guns. Politicians are protected with guns. Why shouldn’t schools be given that same protection? Since when are banks or politicians more deserving of protection? 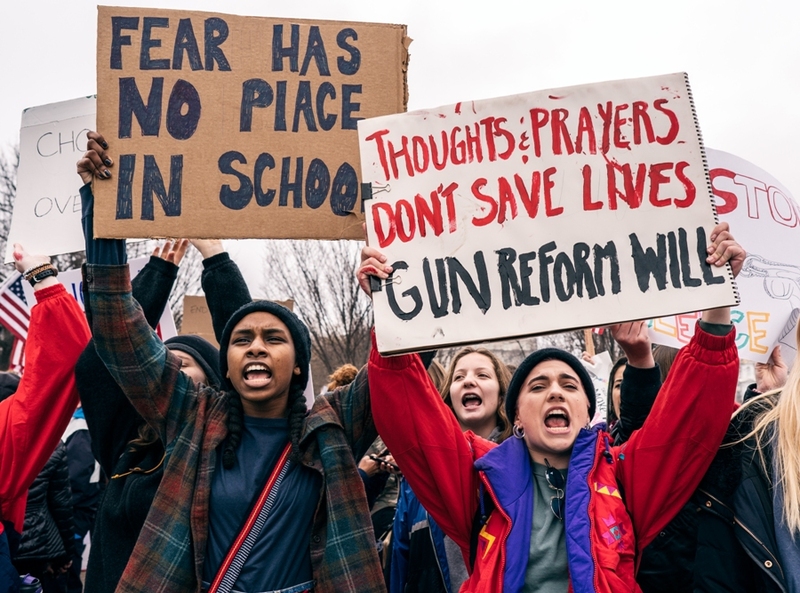 Students are the future of America, and the future should be protected. Many victims and survivors from the recent Parkland shooting have stood up and demanded that lawmakers do something about gun control. The government must begin working on limiting guns to civilians instead of continuing to arm and militarize this society. On Feb. 14, the parents and loved ones of 17 Majority Stoneman Douglas High School students and staff unknowingly kissed them goodbye for the last time. That day, Nikolas Cruz, a former student from that high school, entered the building and ended up murdering those 17 people and injuring 15 others. The majority of the victims were only freshmen, and the teachers that died all died protecting their students. Seventeen victims of cold-blooded murder. Seventeen families that will never be complete again. Innumerable lives have been dismembered and thousands of hearts have been broken from this horrific tragedy. In the past two decades, there have been approximately 100 mass shootings in this country. Just this year alone, there have been 18 school shootings throughout the United States. Apparently, none of these murdered souls and ruined families have been enough to make American lawmakers realize that gun control is what is needed to help stop these shootings. President Trump is choosing to ignore the desperate pleas of the traumatized victims, families and many others all around the country. Instead, Trump and other associates are now proposing that teachers in schools be armed. “The only way to stop a bad guy with a gun is with a good guy with a gun,” chief of the National Rifle Association Wayne LaPierre said. Such a proposal will only make matters worse in America, and it will certainly not stop mass shootings or save the lives of anyone. These ideas only extend “the power of a militarized state at the expense of individual liberty,” Vann R. Newkirk, a writer for The Atlantic, said. When people suggest such ideas, they are undoubtedly imagining themselves being the perfect-aim and unafraid hero that would somehow kill the shooter with no problem. In an ideal world, this person would exist. This, however, is not the perfect world, and the perfect hero with the perfect aim and right amount of boldness is only real in Hollywood action movies. 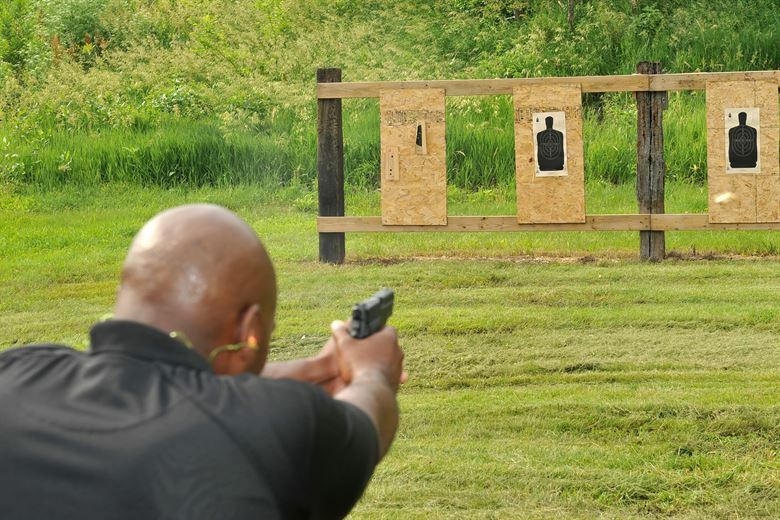 In the real world, when people are put in situations where someone attempts to shoot someone who is already armed, the outcome tends to be tragic and still fatal. Chris Kyle is a fitting example as to why being armed makes no difference in situations like these. Kyle was known as the most lethal sniper in U.S military history and had over 160 confirmed kills. He was an expert at handling military weapons, had executed dozens of enemies before, and was more than accustomed to being in military combat environments. On Feb. 2, 2013, Kyle and a fellow friend accompanied a retired Marine veteran to a shooting range, trying to soothe his PTSD. However, Kyle contacted his friend on the way there, suddenly realizing that the man was much too dangerous. Nonetheless, they were both armed and well-trained army veterans — they had been as prepared as anyone could be in a situation like this. The miraculous and “expected” outcome that Trump and other advocates for armed teachers believe in would be that Kyle and his friend pulled out their arms and shot the man, saving the day, themselves, and everyone around them. However, this was not an action movie, nor the mind of Trump or other believers. The outcome was disastrous — both men were shot dead. Both armed, well-trained, military men were murdered. How can underpaid, overworked, and undersupplied teachers who will never be anywhere near to having the experience and skill that Chris Kyle had be expected to successfully get out of a situation as serious as a school shooting? Even in situations where there have been armed civilians around shootings, the results still ended with fatalities. In the Las Vegas shooting, armed police were prevalent where the shooting took place. However, a horrifying number of 58 people still ended up murdered because it took nearly 10 minutes for the police to locate and stop the shooter. There were armed police officers in the Fort Lauderdale airport shooting, yet five people were still murdered. In the Majority Stoneman Douglas school shooting, there was an armed policeman in the front of the school, yet those 17 students and teachers were still slaughtered. Since having more “good guys with guns” is failing Americans, what more can the American government do? Take a look at the amount of shootings that other first-world countries have had since they began to truly take action toward these tragic shootings. Australia and Britain had both of their turning points with gun control in 1996. In Australia, a 28-year-old man opened fire on a crowd of tourists with an AR-15, killing 3 people and wounding 18 others. Weeks after this incident, Australian politicians and lawmakers got together and completely banned military-style weapons in all parts of the country. Australia also refused the import of these type of guns and created a gun buyback program, allowing Australian citizens to give up their military-style weapons. Many citizens gladly turned over their firearms. Since then, Australia has not had a single mass shooting. In Britain in 1996, Thomas Hamilton, a 43-year-old gun owner, was responsible for the death of 17 people — 16 of them were children between the ages of five and six and one was a teacher. “It looked like we were going down the American route of gun violence at the time, and it just wasn’t what people wanted,” Gill Marshall-Andrews, the chair of the Gun Control Network, said. The country, like Australia, took immediate and direct action after this. The British government then banned all guns. More than 160,000 guns were turned in after this shooting. Only one other mass shooting has transpired since. A positive impact resulted upon both societies since they decided to ban guns. America needs to follow in the footsteps of these nations and strip itself of its militarized way of thinking that has been poisoning the minds of Americans for centuries. America needs gun control, not more terrified, armed civilians hiding behind murderous weapons. Let the horrific school shooting that occurred on Feb. 14, the day of love, be the final one that takes place.